A buffer visiting a write-protected file is normally read-only. Here, the purpose is to inform the user that editing the buffer with the aim of saving it in the file may be futile or undesirable. The user who wants to change the buffer text despite this can do so after clearing the read-only flag with C-x C-q. This is cool, because Perforce makes files read-only by default (to encourage you to open them before you edit them, though you can do this after the fact if you’re careful) and because I’ve been making the files for my web site read-only as a small measure to deter site defacement. I had been using vim for editing my web site files because w! can write to read-only files, but now it looks like I have a convenient way to use Emacs as well. Yod.el (love the name!) is a Yahoo! Messenger client for Emacs. I tried it and it works well, but somehow doing IM in Emacs seems clunky. This may seem blasphemous to some, but perhaps some things are best not done in Emacs. I’ve never really gotten into the WYSIWYG HTML editor (TinyMCE) that comes with WordPress. It’s an impressive application of DHTML, but for blog posting I don’t need a ton of fancy formatting and would rather have something lightweight, fast, and keyboard-oriented. Like for instance, Emacs. Do you post to your blogs using Emacs? What package(s) do you use? Yes, these CSS styles are a blatantly ripped off and then hacked version of the stuff from http://emacsen.org/. This page and its linked pages describe Icicles, which provides extensions to ‘completing-read’, ‘read-file-name’, and ‘M-x’. Most of these extensions involve minibuffer input completion and cycling. I wanted to get remote compiles going in Emacs because I wanted to work in Aquamacs on my Mac. In terminal mode, a lot of keys don’t work like in particular Control + the arrow keys and in X11, I lose my Emacs session every time I disconnect and take my laptop home (unless I use something like VNC (slow) or figure out how to get FreeNX to suspend & resume properly). Set the Emacs variable remote-compile-host to foobar.com -p 8000. The -p 8000 was only necessary for me because I am sshing to a particular FreeBSD jail that has the build environment i need for the particular project I’m working on. Set the Emacs variable remote-shell-program to /sw/bin/ssh. This path is a little unusual because I’m using a version of OpenSSH that I installed on my PowerBook using Fink. I’m choosing this over the stock OS X ssh because OpenSSH 4.0 and up support the ControlMaster feature which speeds up repeated connections to the same remote host. Instead of the Emacs compile command, use remote-compile (defined in rcompile.el). This is very hacky though and not everyone may have root access to the remote host they’re using, so I came up with a patch for rcompile.el which works for me. After deliberating for a while, I’ve finally done it. Yes, that’s right. Like a true Emacs geek, I’ve swapped my “caps lock” and “control” keys. I could see that this could be nice once I get accustomed to it, though for now I keep reaching for the “control” and turning on “caps lock”. I had almost contemplating making both of them act as “control” but decided against it as that will probably just stop me from learning properly. 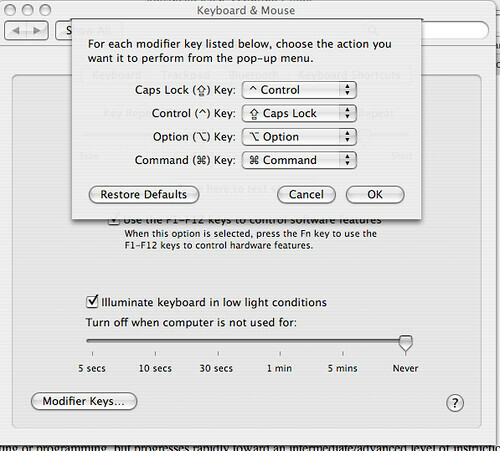 Doing this on a Mac once required extra software like uControl, fKeys, or DoubleCommand, but now in Tiger you can just do it in the Keyboard & Mouse System Preferences panel.